Click through to see the full PDF. Parents, are you looking for more fun, healthy things to do with your kids this summer? 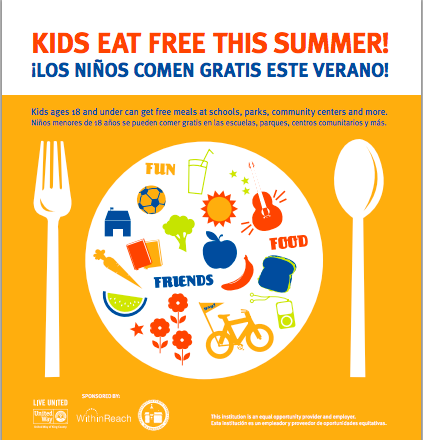 Bring them over to El Centro de la Raza for free lunch and fun activities every weekday! We welcome all kids/youth 18 and under to join us for lunch and fun crafts, games, sports and activities every Monday-Friday from 11:30-1 p.m. in the playground. Did you know over the summer families spend an increased $1000 in food while kids are home from school? Save money and feed your kiddos healthy, nutritious lunches at our free lunch program. The program will run every week though 8/14. No proof of income, address, or citizenship is ever required, all children/youth 18 years and under are always welcome! The El Centro de la Raza Playground is located at 2524 16th Ave S. Activities and lunches will be offered every Monday-Friday from 11:30 to 1 p.m. If you have questions about the program, call 1-888-436-6392, text MEALS to 96859 or visit parenthelp123.org.